Mr. Sosa joined Lara & Luna APC the Summer of 2017 and holds a strong client-centered approach to litigating through disputes with employers. He has demonstrated a commitment to pursuing all angles of discovery, fighting for that discovery in Court, and thoroughly investigating the facts and witnesses supporting each case. Mr. Sosa is passionate about helping employees who face illegal treatment at work achieve the best result possible for themselves, their families, and the community. Through his work at Lara & Luna APC, Mr. Sosa has been successful in defeating an employer's motion to compel arbitration and obtaining court orders compelling employers to properly respond to discovery. Mr. Sosa has also defended and taken depositions in discrimination, retaliation, and harassment cases. 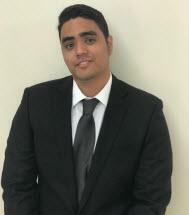 Prior to joining Lara & Luna APC, Mr. Sosa practiced with an insurance defense firm, where he gained experience in law and motion and different stages of the discovery process. Mr. Sosa is fluent in Spanish and in his spare time he enjoys building computers, reading science fiction novels, and drinking teas with his wife.